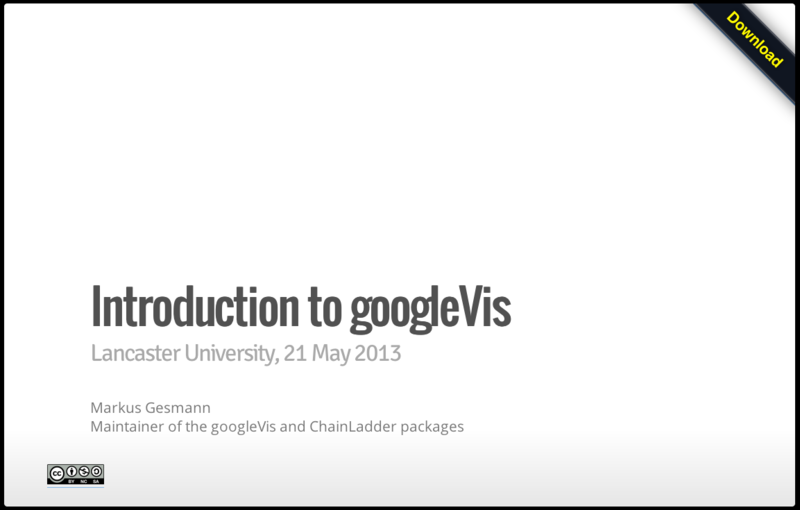 Last week I was invited to give an introduction to googleVis at Lancaster University. This time I decided to use the R package slidify for my talk. Slidify, like knitr, is built on Markdown and makes it very easy to create beautiful HTML5 presentations. In the past I have used knitr in combination with pandoc to generate a slidy presentation. However, with slidfiy I can do all this in R directly. And better, Ramnath provides me with a choice of different layout frameworks and syntax highlighting options. Finally to top it all, publishing the slides on Github was only one more R statement: publish(‘mages’, ‘Introduction_to_googleVis’). I will give a half-day tutorial on googleVis with Diego de Castillo at useR2013! in Albacete on 9 July 2013. I hope to see some of you there.